Last week, an avalanche engulfed a hotel nestled in the steps of Italy’s Gran Sasso mountain. The avalanche, which struck in the early hours of morning, caused extensive damage to the hotel and claimed at least 7 lives. At least 22 others are still missing. 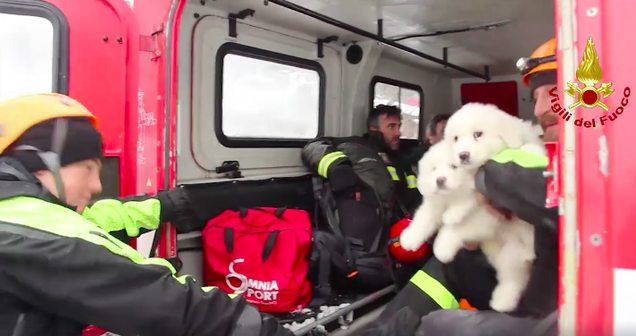 But after a grim weekend, Italian firefighters stumbled across a glimmer of hope—the team found three tiny month-and-a-half-old Abruzzo Sheepdog puppies trapped in the hotel boiler room. They had miraculously survived for five days after the avalanche. So far, rescuers have pulled 10 survivors from the snow, but they’ve faced insurmountable hurdles since the avalanche was first reported; extreme weather conditions, in addition to the inaccessibility of the Hotel Rigopiano, have made it nearly impossible to find survivors. You can watch the full video of the rescue below. Bring tissues.